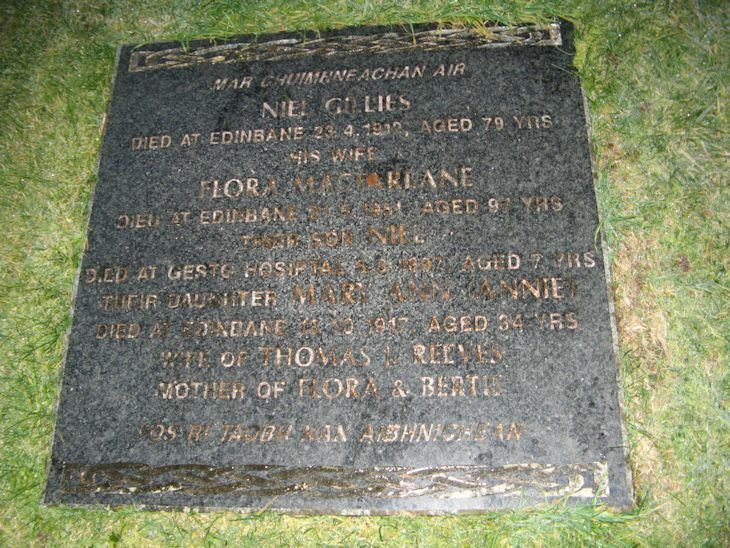 Skye Gravestones | Neil & Flora (Macfarlane) Gillies & family. Neil & Flora (Macfarlane) Gillies & family. NEIL GILLIES/died at Edinbane 23.4.1912 aged 79 years/his wife/FLORA MACFARLANE/died at Edinbane 21.5.1951 aged 97 years/their son NEIL/died at Gesto Hospital 5.8.1897 aged 7 years/their daughter MARY ANN (Annie)/died at Edinbane 13.10.1917 aged 34 years/wife of THOMAS L. REEVES/mother of FLORA & BERTIE. Fòs ri taobh nan aibhnighean. Picture Added on 26 June 2014.